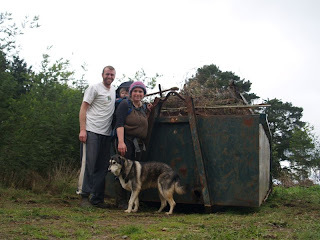 Here we are with a scrap metal bin (6 x 12 x 4 foot) filled with metal left lying around our farm by the previous owners. The farm was a dairy farm once apon a time, and also had a house which is no longer there. Therefore 100 odd years of old rusty corrugated iron is around the place, but at least this lot is off to start a new life as cans or something else! We will probably fill onther one, as there is still more metal, old ploughs etc, and plenty of old barbed wire fencing. We really don't like barbed wire! We had the bin for about a week, and spent nearly every day of that week throwing stuff in. So its nice to be rid of it. 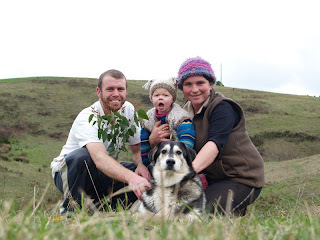 Here we are with the Mountain Ash Eucalyptus regnans tree we planted for our little girl when she was born (and yes we did plant the placenta with it). Its thriving, and has lots of new growth. We look forward to taking this yearly photo, and watching the tree grow along with our daughter. Her middle name comes from this tree.